If you've ever wanted to learn more about a trading strategy called Harmonic Trading, which uses techniques like the AB=CD pattern, the Gartley pattern, and the Butterfly pattern, and much more --- you should subscribe and participate in the new thread by George on the forum. 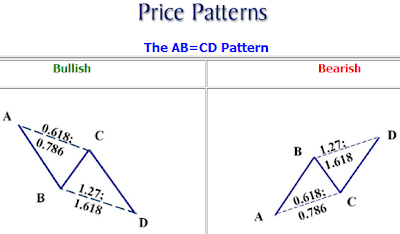 The AB=CD pattern is a price structure where each price leg is equivalent. The Fibonacci numbers in the pattern must occur at specific points. In an ideal AB=CD, the C point must retrace to either a 0.618 or 0.786. This retracement sets up the BC projection that should converge at the completion of the AB=CD and be either a 1.27 or 1.618. It is important to note that a .618 retracement at the C point will result in a 1.618 BC projection. A .786 retracement at the C point will result in a 1.27 projection. The most important consideration to remember is that the BC projection should converge closely with the completion of the AB=CD. The structure of the Butterfly pattern was discovered by Bryce Gilmore. In my experience, I believe an Ideal Butterfly Pattern, which requires specific Fibonacci ratio to define the structure - including a mandatory 0.786 retracement of the XA leg as the B point - offers more precise Potential Reversal Zones (PRZ) and more significant trading opportunities. Also, the Butterfly pattern must include an AB=CD pattern to be a valid signal. Frequently, the AB=CD pattern will possess an extended CD leg that is 1.27 or 1.618 of the AB leg. Although this is an important requirement for a valid trade signal, the most critical number in the pattern is the 1.27 XA leg. The XA calculation is usually complemented by an extreme (2.00, 2.24, 2.618) BC projection. These numbers create a specific Potential Reversal Zone (PRZ) that can yield powerful reversals, especially when the pattern is in all-time (new highs/new lows) price levels. The Gartley pattern was outlined by H.M. Gartley in his book Profits in the Stock Market, published in 1935. Although the pattern is named "The Gartley," the book did not discuss specific Fibonacci retracements! It was not until "The Harmonic Trader" was released that the specific retracements of the B point at a .618 and the D point at a .786 were assigned to the pattern. There are others who have assigned Fibonacci retracements to this framework. However, they use a variety of Fibonacci numbers at the B and D points. Despite these variations, the Fibonacci retracements that yield the most reliable reversals are the .618 at the B point and the .786 at the D point. Furthermore, the pattern should possess a distinct AB=CD pattern that converges in the same area as the 0.786 XA retracement and the BC projection (either 1.27 or 1.618). The most critical aspect of the Gartley is the B point retracement, which must be at a 0.618 of the XA leg. The thread is just getting started. Come join us!